Alix Bryan of P.E.A.C.E Scooter fame passed through Chicago while I was at Amerivespa. I’d hoped to meet her for dinner at a Korean restaurant Sunday night with some Modern Buddy folks, but I got back kind of late and some wires got crossed so I ended up eating with Ryan instead. Sorry Alix. 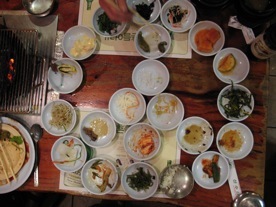 We made this peace sign out of the banchan dishes, in your honor. Alix got some news coverage in Cleveland the other day, and her months-long journey will end Friday (August 8, 2008) with a victory lap around the White House (a group ride leaves from Vespa Arlington at noon), then Scoot Richmond is hosting a party for her at 5pm on Saturday, featuring the final raffle drawing. Congratulations Alix! Next Next post: 3-wheeled BMW scooters in works?